If you have sat through a sales training class or read a sales coaching book in the past few years, you have probably learned that the fundamentals of selling have changed. You probably learned that creating value in your product and building strong relationships is incredibly important. Unfortunately, most of these seminars and sales books don’t talk about the growing need to learn your customer from a generational selling perspective. Being a sales and marketing professional today requires more skill than in the past. A great sales professional has always known that the major key to sales success is the ability to build quick rapport and relate to the customer in a way that builds a trustworthy relationship. Selling and marketing your products has changed and many sales professionals lose business because they do not understand how each generation varies greatly in their buying styles, communication, marketing channels and values. Knowing your customer has taken on a greater meaning and requires an informed perspective to reach cross-generational target markets. Today’s sales and marketing professionals are being challenged like never before to meet the needs of a multi-generational work force. Generation gaps are as old as history. Nevertheless, these changing dynamics have required companies to change selling strategies a bit and start adopting the idea of cross generational selling. In other words, what might have been a successful approach with a customer of the baby boomer era in the past, may not resonate with a Gen X or Gen Y buyer today. It’s important that companies train their sales staff to adapt their approach and communication skills to meet the values of each generation. So, how does a sales or marketing person sharpen their skills and learn to relate to clients of all generations with widely different expectations? Currently, the demographics of the labor force span four generations (soon to be 5 generations when Gen Z hits the workforce around 2020). These generations are the Mature/World War II Generation, Baby Boomers, Generation X, and Generation Y/Millennials. 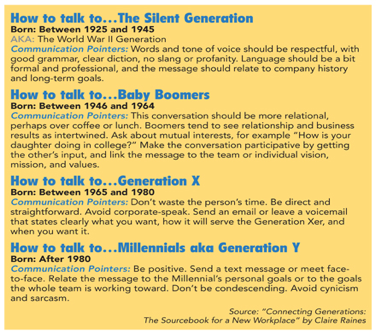 In a survey conducted by Randstad, it showed that 51% of baby boomers and 66% of the World War II generation, little or no interaction with Gen Y. This survey also states, that 71% of Gen Y and 67% of Gen X report that they have very little to no interaction on a daily basis with older generations. Marketing and sales professionals that understand the different preferences of each generation and know how to market to one group vs. another creates success in customer segmentation. Problems arise and companies lose customers when they have only one message and one targeted marketing channel to communicate their products to the four different generations of buyers. These different generations also have distinct preferences in behavior, attitude and approach they want from their sales and marketing representatives. The saying, “one size does not fit all” is true when it comes to selling to varying age groups. First of all, remember that “two” things control someones life: Beliefs & Values. Beliefs create someones perceived reality. Values arise from a persons core desires and unconsciously motivate us. Salespeople and marketers need to try and learn the basic Beliefs & Values of each generation and the factors that drive them to make specific decisions. In turn, the marketer can then tailor strategies to communicate effectively with the target market. Second, it is important to understand that each of these generations has some kind of life agenda shaped by their childhood and coming of age. This influences many aspects of their lives, including the way they view conflict, negotiation and perceived value. Review where and how you are selling your products or services. Older customers might prefer to receive your product information via the mail, phone or in person, while younger customers might prefer email, text messaging, videos & online advertisements. For Gen X & Y it is important to make sure your website is optimized for a smart phone. It is also important that you engage them through social media platforms and catchy videos. Consider direct mail, newsletters and catalogs for customers especially in the traditional, baby boomer and Gen X generations. Understanding the buying habits of your customer is key to better engaging them. Here are a few tips when selling to each generation. 1. Selling to Silent Generation (1925-1945): Cash is king, money is private, no sense of urgency, averse to spending what they do not have. Frugality, commitment, conformity, hard work and responsibility are hallmarks of this generation. They typically don’t buy unless their perceived value largely out weighs price. 2. Selling to Baby Boomers (1946 – 1964): Much lower net worth than parents, average retirement age is 70, lack of confidence in technology, prefers face to face selling, must build rapport before comfortable with buying a product/service, needs undivided attention, authentic in conversation, has seen many marketing fads, wants a sense of connection. Easy to sell them products or services that they think will enhance their lives. 3. Selling to Gen X (1965- 1979): Values honesty & transparency, nontraditional, net worth lower than baby boomers, sense of survival, tenacity, resiliency, influential, outside of the box thinkers, risk takers, adverse to ad hype, savvy negotiators, conscious about value and price, needs a value proposition that favors them, doesn’t favor statistical info, does not respect a hard close, makes buying decisions rather quickly after looking at the facts, everything is on demand, not a schedule. 4. Selling to Gen Y/Millennials (1980 – 1995): Educated, tech-proficient, distrust traditional advertising, listens to peers opinions, more financially grounded, takes longer to reach large milestones or big purchases, experiences trump money, very social, uncomfortable getting behind a product/service, prefers brands that create a persona that feels right. Know who will be on the receiving end of your message (e.g., the demographic make-up/generation) and then, weight them by purchase power. It’s a gross generalization to say that the older generations are more risk-averse than younger generations. At the same time, aggressive, age-focused marketing tactics that may work well with younger generations (as opposed to a mass media multi-generational approach) can work to the advantage of an up-and-coming youth market-oriented company with a tight marketing and advertising budget. If you know your audience and can easily segment them by purchasing power, focus on where you can get the highest return for your advertising dollars. Remember that saying, “You’re only as old as you feel.” Many Boomers and Matures don’t come close to feeling their age and don’t want to be told what to buy based on their biological clock. These generations want to be perceived as still young and vibrant, while the Xers and Millennials want be taken seriously, considered mature, and not patronized.